Years of training and dedication gift samurai with preternatural talents. 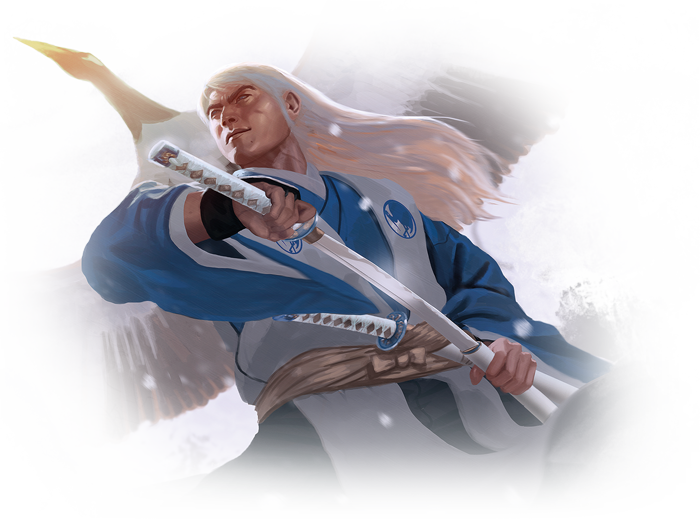 These abilities can influence many aspects of a samurai’s life, and they exemplify the focused study, connection with the kami, and elite martial training that sets the samurai apart from mere peasants and merchants. 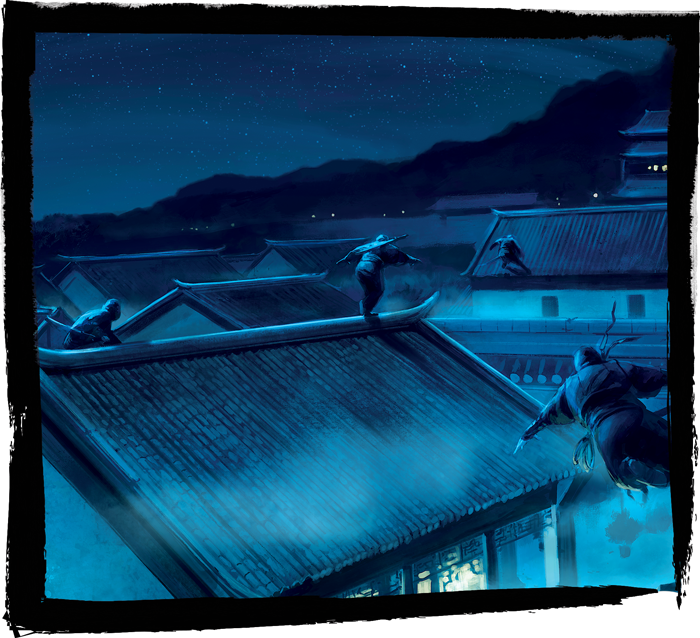 In Legend of the Five Rings Roleplaying, a roleplaying game of honor and steel, you and your friends become samurai of Rokugan, who must overcome the challenges that face you with exemplary skill and training. Fortunately, your techniques set you apart, even among other samurai, whether you're a bushi, a courtier, a shugenja, or a monk. Join us today as we explore the various techniques that your character can use to excel in Legend of the Five Rings Roleplaying! Every type of character has access to different techniques, and kata are the techniques of bushi and others skilled in the use of weapons. Subtle strikes, intimidating volleys of arrow fire, and blows of bone-crushing might are the purview of kata. 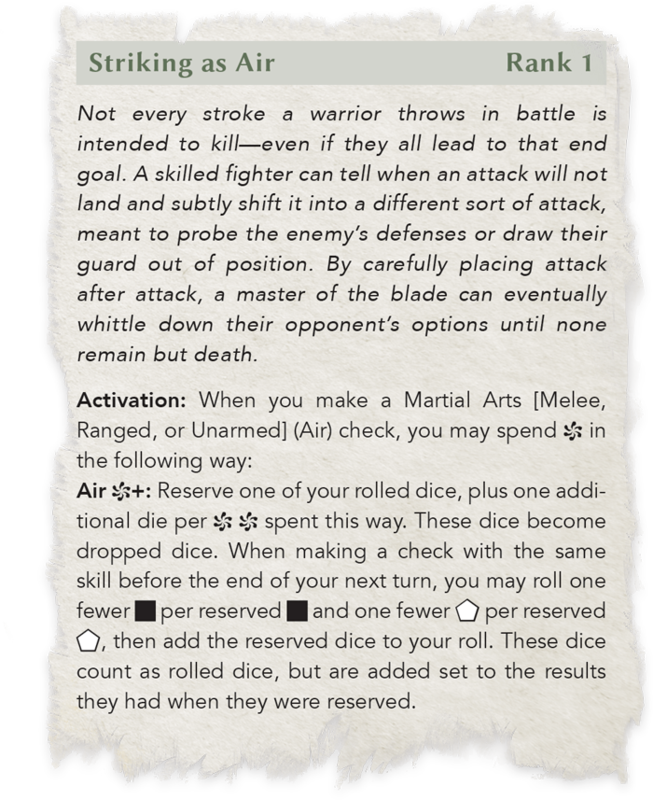 For example, Striking as Air is a kata that allows the samurai to strategically assail their opponent over multiple turns by reserving dice from a current roll and applying them to a later roll! With this ability, you may see that you've rolled one or two good results, but your entire roll is not sufficient to strike the target. Using Striking as Air, you can reserve those valuable dice for a better strike in the next round! Even a missed attack by a trained samurai can set up a deadly follow-up strike. 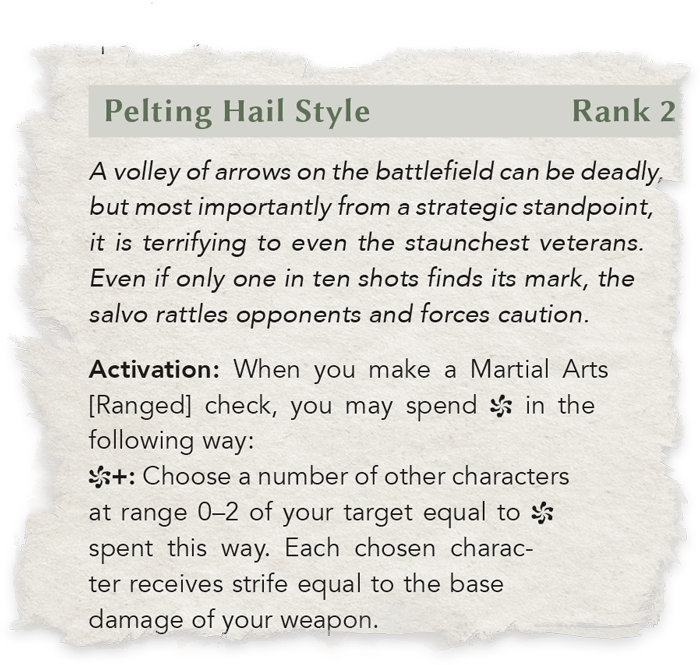 As another example, the ranged kata known as Pelting Hail Style can turn a simple bow and arrow into psychological warfare. Whenever the character makes a ranged attack, they may inflict strife on multiple opponents in close proximity, weakening their resolve and potentially causing them to flee or make a foolish and unbalanced attack. An uncentered enemy is easily toppled. The spirits of the world do not always lend their power freely. They must be implored, coaxed, sometimes bribed. As a living being with power, they choose whether or not to come to the aid of even the mightiest samurai. 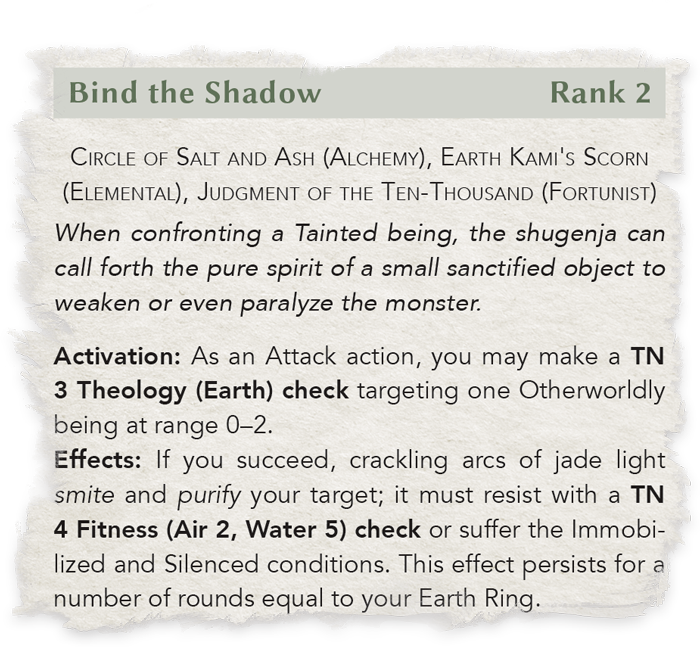 Invocations are techniques that shugenja learn in order to bring the power of the kami to bear, often manifesting in brilliant displays of elemental magic. Call Upon the Wind is an Air invocation that requires a Theology (Air) check. 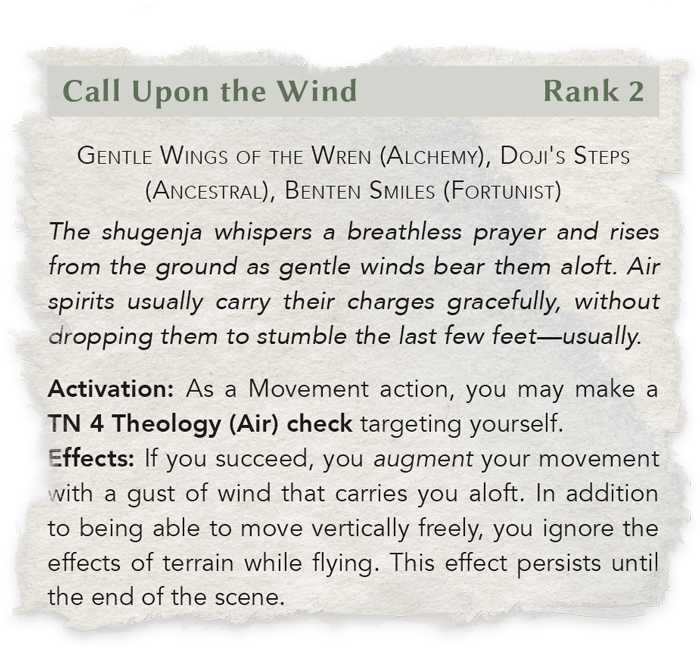 If successful, your shugenja spends the rest of the scene enveloped in lofting winds, making them capable of vertical movement and gliding freely over any difficult terrain. By spending additional opportunity results, you may even carry along willing allies into the air! On the other hand, the Earth invocation Bind the Shadow confines an otherworldly being in a crackling prison of jade light. By spending opportunity on the invocation check, your shugenja may make it even more difficult for the tainted creature to escape its bonds, potentially locking the monster away for as long as a century! The world of Rokugan contains numerous disciplines, and while kata and invocations may seem like the most eye-catching, the duties expected of every samurai have supporting techniques. Monks have access to kihō: the art of aligning one’s spiritual energy—or ki—with the energy of the entire universe. These techniques have been perfected by monks over the centuries, and offer a two-fold benefit; one when the technique is activated and an ongoing enhancement that may last for some time. Rituals blend the mundane and the arcane to give characters extra benefits when engaging in downtime during or between adventures. The techniques of shuji harness the art of communication in the way kata uses physical might: enhancing attack, defense, and control. Mahō techniques are largely forbidden, as they are empowered by calling upon the corrupted kami of the Shadowlands. Finally, ninjutsu is a collection of techniques taught to shinobi to turn even shadows and whispers deadly. Techniques aren't the only tools that your samurai can bring to bear in your adventures. After all, every samurai but the most austere monk will travel with recognizable equipment, including weapons and armor that clearly mark their station. The Legend of the Five Rings Roleplaying Game Core Rulebook includes a full collection of gear, ranging from bows and throwing stars to the most resilient Crab Clan armor. Still, none of these weapons and tools is more iconic than the katana. The meter-long curved blade of the katana is iconic for samurai across Rokugan. It is borne by generals and soldiers, scholars and scouts. Training with this weapon can be found nearly everywhere that strength of arms is required. Its damage and deadliness ratings, both essential for dispatching foes in different situations, are as high as any other sword that can be wielded in one hand. However, the control of the blade afforded by a two-hand grip raises its deadliness rating higher than any other weapon available to characters. Whether in a duel or a skirmish, an expert with the blade could eliminate enemies nearly instantly with quick, precise cuts. The katana also possesses two additional qualities, Ceremonial and Razor-edged. Any item with the Ceremonial quality affords its bearer a bonus to convincing others of their identity and station. The Razor-edged quality, though, is both a risk and a benefit. On successful attacks, the owner may spend opportunity results to increase the deadliness of the weapon for a surer strike—but a successful hit that is reduced to zero damage (such as through armor or parrying) causes the weapon to become damaged! Adventures in Rokugan are dangerous, mystical, and noble. Some samurai rely on their strength and weaponry, others on their connection to the kami, and others still on their wits and intelligence. None of these alone will keep even the most ardent servants of clan and Empire safe eternally; only through cooperation, trust, and combined will can your samurai succeed in their adventures! 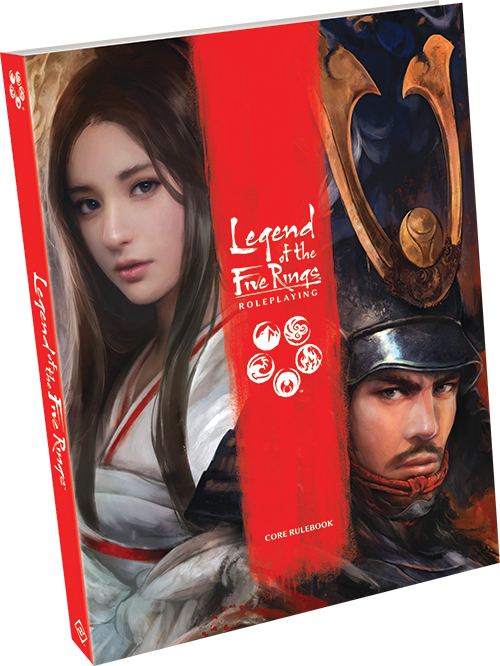 Gather your tools and pre-order the Legend of the Five Rings Roleplaying Core Rulebook (L5R02) from your local retailer or our website!